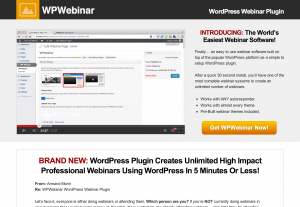 I just released my brand new wordpress webinar plugin called… WPWebinar. This revolutionary wordpress plugin makes the whole process of creating webinars as simple as one, two, three. Because it works on WordPress, everything is drop dead simple. WPWebinar gives you everything you need. Like I said, it’s 100% built into WordPress. What makes this different, is that many webinar software on the market claim they are a WordPress ebinar plugin, but they are not. They are external systems which plug into WordPress. We are built, designed and work exclusively inside of WordPress. Click Here For Details of WPWebinar Here!